He Told Us He’d Be Back!! 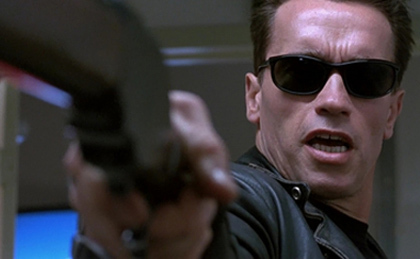 Arnold Schwarzenegger Attached to Fifth Terminator Film!!! Arnold is confirmed to reprise his role as the Terminator in yet another go at the Terminator franchise in Justin Lin’s Terminator 5. This is not very surprising as I’m sure if he weren’t running California, he would have been in the last film. Deadline reported that Justin Lin who directed the last three Fast and Furious films will direct the next Terminator film and that Arnold is very excited to return to his most famous role. There really has not been a decent Termintor film since James Cameron’s T2: Judgement Day. Part three and four of the franchise were less than stellar with the most recent one being god awful. Hire Tarantino, Cameron, J.J. Abrams, or Roberto Orci to write this fifth installment. Then you just might have a good film and return to form. When Terminator Met The Fast And Furious!!! This entry was posted on Wednesday, April 27th, 2011 at 11:01 am	and is filed under Film, News. You can follow any responses to this entry through the RSS 2.0 feed. You can skip to the end and leave a response. Pinging is currently not allowed. « COMIC BOOK RELEASES FOR THE LAST WEEK OF APRIL!! !